A year ago, on a warm, windy night, Paul Lowenthal got the call; he was needed at work. The Tubbs Fire, on its way to becoming the most destructive blaze in California history, was spreading into Santa Rosa, and Lowenthal, the city's assistant fire marshal, needed to get people out. Later that night, he drove past his own neighborhood. He worked the next five days on just a few hours of sleep, until finally, he stopped to take stock. Fueled by extreme winds, Sonoma County’s Tubbs fire killed 22 people and destroyed more than 5,000 homes and buildings. Since then, the community has banded together to pick up the pieces. But it’s also been grappling with a tough question -- one that faces fire-ravaged communities around the state. Wildfire is a normal part of the California landscape. So, how -- and where -- should residents rebuild to protect themselves? Hundreds of Sonoma residents have opted to stay put, both financially and emotionally tied to their land. Lowenthal is one of them. It happened 54 years ago, when the Hanly Fire burned almost exactly same area. But since then, Santa Rosa's population has grown by nearly six times, and Lowenthal was keenly aware of this latest fire’s effect on an already-tight housing market. “I made a decision that it made more sense to rebuild here,” he says. His daughter was also a big part of that decision. In the hills above Santa Rosa, wooden frames of houses are rising among the blackened trees. 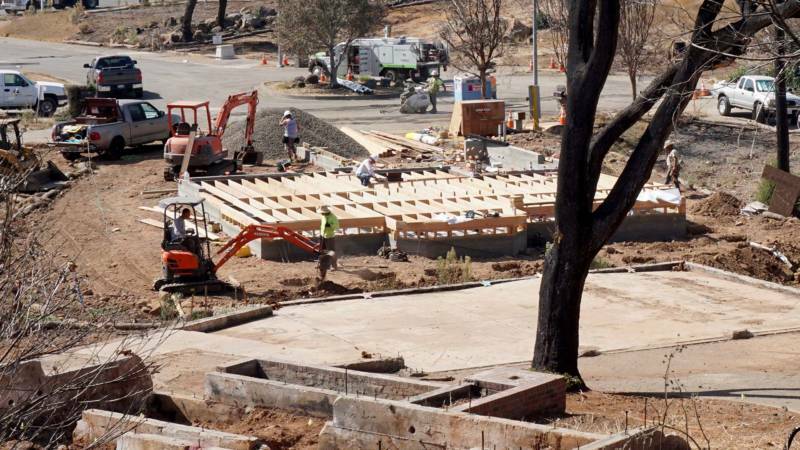 Many of the rebuilt homes will include new fire-resistant building materials, something few had when the fire swept through. Still, because of California’s decade-old zoning rules, almost 2,000 of the destroyed structures will not be required to meet building standards for wildfire-prone areas. Some homeowners are taking it on themselves to meet them anyway, dipping into their insurance payouts to cover the cost. Others are not. At the same time, given the region's severe housing shortage even before last year’s firestorm, city and county governments are under pressure to build new housing in areas at risk for wildfire. As people are trying to heal and recover, local leaders have been faced with balancing those delicate issues. With climate change making California’s fires more extreme, their decisions will affect lives for decades to come. 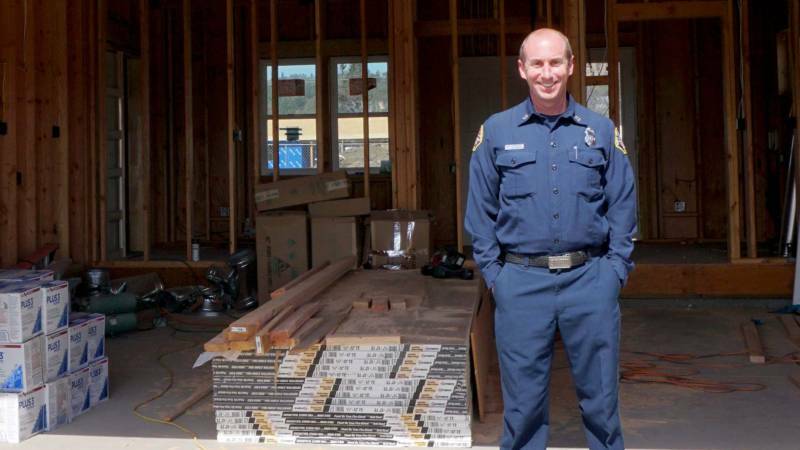 A year after the fires, Lowenthal’s Larkfield home is finally taking shape, still a few weeks away from final inspection. This time, he says it will be better prepared to withstand fire, built with cement-fiber siding and other fire-resistant materials. “Between the roof, the siding, things of that nature, it was definitely a step that I wanted to take,” he says. But Lowenthal isn’t legally obligated to do any of that, as his home was outside the area subject to California’s “Wildland-Urban Interface Codes.” They include a broad range of standards for siding, roofs, decks, and windows, as well as requirements for gutters and attic vents that are meant to prevent embers blown ahead of a wildfire from igniting a home. The zones are established by a set of 2008 Cal Fire maps that outline wildfire risk by considering vegetation, fire history and slope. Sonoma County's zones are based exactly on those maps, while the city of Santa Rosa had extended the stricter requirements somewhat beyond what was on the state maps. Almost 2,000 buildings destroyed in the Tubbs fire in Santa Rosa and Sonoma County weren’t mapped in those zones and won’t be required to use fire-resistant materials. “We don’t have an extra set of rules or requirements that we put on people to rebuild,” says David Guhin, Santa Rosa’s director of planning and economic development. Guhin says Santa Rosa would be on shaky legal ground if it imposed new wildfire building codes on structures that weren’t required to meet them when they were destroyed. But since most of the homes were built decades ago, before most modern building codes, he says even the basic code upgrades they'll undergo will help. Fire maps based on 2007 assessment. “The housing stock that’s going in is much more resilient than the previous house stock,” he says. Still, many believe Cal Fire’s maps are outdated, since they don’t reflect the extreme nature of today’s fires. The maps assumed fairly benign weather conditions, just 12 mph for "mid-flame" wind speed, the height that affects fire behavior. During the Tubbs Fire, gusts hit almost 80 mph. Cal Fire is in the process of updating the fire hazard maps using more realistic data, including localized information and historic fire conditions. A draft of the maps is expected sometime next year. The new maps could put many homes into a fire hazard zone that aren’t in one today. But several North Bay officials say the community can’t wait for that to be sorted out. Wick says many homeowners are choosing fire-resistant materials anyway, such as cement-laden siding and metal roofs. Some fire victims have opted to pull up stakes after living through the fire's emotional trauma or due to steep rebuilding costs. In the hilly Fountaingrove neighborhood of Santa Rosa, for-sale signs sprout from empty lots among the construction sites. Other homeowners are tied to their property, either restricted by insurance policies that prescribe where they can rebuild, or simply priced out of other Bay Area homes. And that concerns Santa Rosa City Council member Julie Combs. “I know I’ve heard stories about flooding along the Mississippi and thought, 'Why did they keep rebuilding there? '” notes Combs. Combs says she’s interested in programs like those that already exist for flooded homes, where governments or neighbors can buy out inundated properties so they won’t be re-developed. She’s not confident that today’s wildfire building codes are enough to protect people. The codes are meant to reduce risk, but don’t eliminate it. Within the Tubbs fire footprint in Santa Rosa, 22 homes were built with the most recent wildfire codes before the fire. Twenty-one of them burned anyway. “That doesn’t strike me as particularly good odds,” says Combs. Homeowners considering not rebuilding face another hurdle: there are few other places to go. In Santa Rosa, the Tubbs fire obliterated five percent of the city’s housing stock, exacerbating an already brutal housing market. Before the fire, the city estimated it needed 5,000 more housing units. The fire added 3,000 more to that number. Santa Rosa is pushing for more “in-fill development,” putting housing downtown and closer to public transit. But there has long been pressure to build in the surrounding hills, where the wildfire risk is highest. In February, the Santa Rosa City Council faced down that question. San Francisco-based City Ventures asked for a zoning change to allow its Round Barn Village project to go forward. 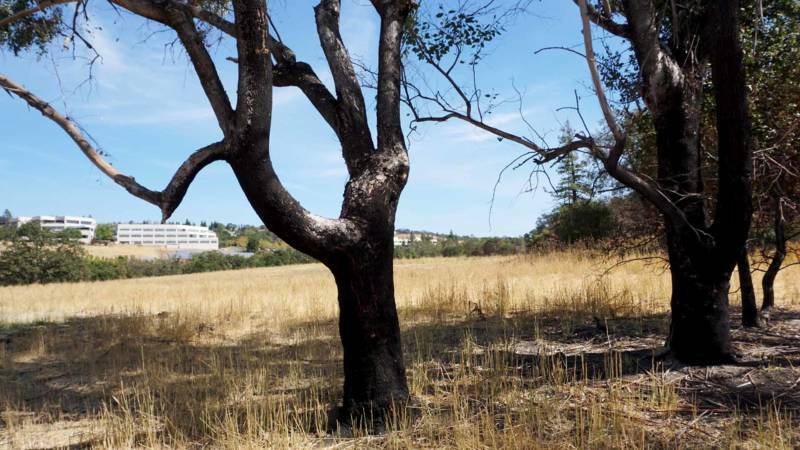 The 237-unit townhome development is proposed for a hillside that burned in the Tubbs fire. City Ventures made the case that the homes would be built using wildfire standards and would provide much needed affordable housing. But doubts hounded at least one council member. 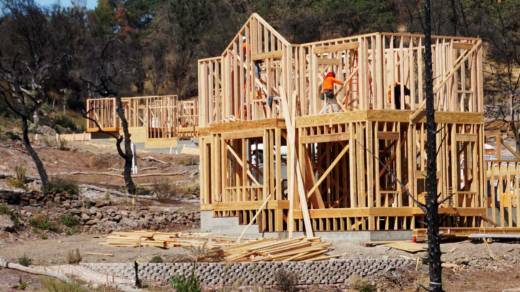 Sonoma County is also facing pressure to build. In communities still in shock from the fires, these fraught decisions won't come easily.